When you’re living in a small space you find yourself getting creative when it comes to storage. If you’re new to tiny living and you haven’t yet figured out what to get rid of, often times the amount of stuff you have greatly exceeds the storage space of your new small home. There may be other circumstances that require you to hold on to a certain inventory of items. These items may be for a home-based business or to accommodate your plan to move from your current tiny or micro apartment to a small house. I am not going talk too much about the plethora of storage containers and systems that are available except to mention these things. Go to a few discount stores like Ikea, Walmart, and Target and check them out. You might find a few containers that solve a significant portion of your storage problem. I particularly like the storage containers that go underneath your bed because this is usually a wasted space. This leads to my first inexpensive storage method. In my early 20’s, my girlfriend and I moved into a small studio apartment. The amount of stuff we moved into it greatly exceeded its storage capacities. There were furniture and boxes stacked almost to the ceiling in the main room. There was so much stuff we had to create multiple pathways between the boxes so that we could get to the bed, bathroom, and kitchen. It looked ridiculous. And it made our new life there very uncomfortable. Fortunately, my girlfriend was very easy-going, so she didn’t complain much. I had to come up with a clever way to make this apartment more livable. 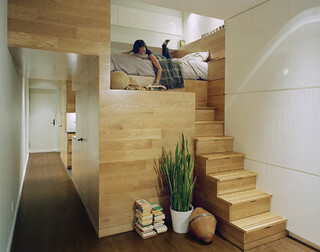 I had already had a lot of experience in living in tiny spaces, so I knew I could come up with a solution. And I did. One day when I was in that apartment alone I began walking around the main room trying to envision a solution. All the closets and cabinets were full. I couldn’t put dressers in there anyway. So how could I do this? I noticed that the only available space was over our queen-size bed. Then I got the idea that would transform our tiny apartment. 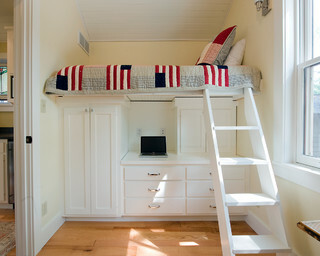 Raise the bed about 4 feet and use the space underneath for storage! But how could I do this securely? As luck would have it, my girlfriend and I each had a dresser that was the same height! So I put my dresser at the foot of bed and hers on the side of the bed with the drawers facing out so that we could use them. Then I put some other sturdy furniture and boxes at the two other sides. I filled in the remaining space with the boxes that were left. All the boxes and extra pieces of furniture were now underneath the bed. The final touch I made was to place a step-stool next to the bed for easy access. The apartment looked completely different. 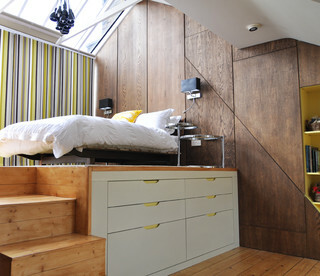 It was not only livable now, but this new loft-style bed made it look pretty cool! It was almost like it was made that way originally by the apartment builder. My girlfriend was blown away she came home. She loved it. Everyone that saw it thought I should become an interior designer. I’ve always thought that this simple design could be used to create a permanent structure. Here’s an inexpensive and a more elaborate way to do it. Buy four to six or more inexpensive, but sturdy, identical and unfinished dressers with a height of about 4 feet. Anything taller than 4’ would require a small ladder. A well-made buck bed ladder would serve this purpose nicely. Position the dressers to the same length and width dimensions as your bed. Attach the dresser together and create a foundation for the bed using top quality 2×4”s. You want the best 2×4”s you can find so that the finished product looks like a single piece of furniture. If your bed is an extra-large king-size you might consider using 2×6”s instead. To keep the bed in place you could either move the dressers out 2 inches so that you could add 2×2”s along the front edge. Or attach a 1×2” or 1×4” on both sides of the dresser vertically so that about 2-3 inches of it is above the top. If the top of the dresser has an overhang or there’s no space on either side of the drawers, you’ll have to use the first option, which I think would look best. Run the 2×4”s along all four sides and across the center in several places. To prevent the wood from splitting or cracking, drill guide holes through the 2×4”s and into the top of the dressers before you attach them using speed screws. You could also use bolts if you want. Do not use glue or nails so that you can disassemble it if you move or want to make changes. Speed screws and a cordless power drill work best. You could hide the storage area by attaching curtains between the dressers or by rigging up sliding pieces of wall paneling. I’d choose unfinished wall paneling so that you can make everything match. The last step is to stain or paint all the dressers, 2×4’s, and wood paneling – if you used it instead of curtains. Here’s the easiest way to visualize this. Picture an unusually low and small loft inside the space. Now image a tiny room built below it. Two of the exterior walls of this tiny room would have 1-2 short doors and built-in dressers, cabinets, and shelves. Two of the existing walls would be used for the other two sides. Its interior would be your new storage room. It would be outfitted with protected lighting and a few electrical outlets. No heating or cooling feeds would be required. And since this tiny room would reduce the cubic space of the room, your utility bill could go down a bit. Do it yourself or a good handyman should be able to do the job. This is an incredibly simple solution, but it does the job and creates a new counter space for business equipment, craft work, or folding your laundry. If you have a bunch of empty computer/TV boxes that you want to save along with a good number of boxes filled with stuff that you don’t expect to use in near future, you can use them as a foundation to create a new counter space. In doing this you’ll eliminate the clutter and free up some space while creating a useful counter area. Here’s how you do it. Many large home improvement stores sell inexpensive multipurpose white Formica countertop pieces. As I recall they come in a couple of different sizes. I used the 2’x6’ and I got them at Home Depot. Don’t confuse these with the ones you’d find in the kitchen area which would be much more expensive, but they would look very nice. I used these for a variety of projects including building a massive desktop (on top of file cabinets), laundry folding area, garage workbench top, and more. Layout a foundation using your largest, strongest boxes and place them in the same length and width dimensions as your countertop. It might seem like this would be difficult to make it come out right, but once you get underway and play with it a bit you’ll find that it will come together. You might have to add a couple of phone books or old magazines to make the top level though. I was always amazed how it comes out almost exactly like a large uniform cube. I would have never guessed that it would turn out that way when I started. How high you go depends on what height is comfortable for you and what you’re going to use it for. The one I made was about 4’ high and I used it for business related equipment and materials. I had all my empty computer, monitor, printer, scanner, and TV boxes below it. I always keep these specialized boxes because they are the safest place to put your electronics and appliances if you move, store them, or need to ship them in for service. Back in 2000 when I started on my Internet entrepreneurial adventure, I lived in the most unusual little studio apartment I have ever seen. It was a few blocks from the beach in a nice close-knit community in Southern California. Although this apartment had a small unattached closet, it didn’t have any storage areas, so I had to create one using this method. The last thing you’ll need to do if you want is to hide the storage area. A curtain or piece of fabric works well. I had extra pieces of the Formica countertop material, so I put them in front vertically. I don’t necessarily consider this to be a permanent storage solution. But it can certainly remove a lot of clutter and add a useful counter at minimal cost and effort. I expect to share more inexpensive storage methods that I’ve discovered in the future. Guru Habits' favorite products & services.